About 8 years ago I lived in California while I was studying my Masters of Fine Arts at CalArts. Now if you have ever been to California, you might have noticed that there is a huge amount of totally to die for scrumptious Mexican food. 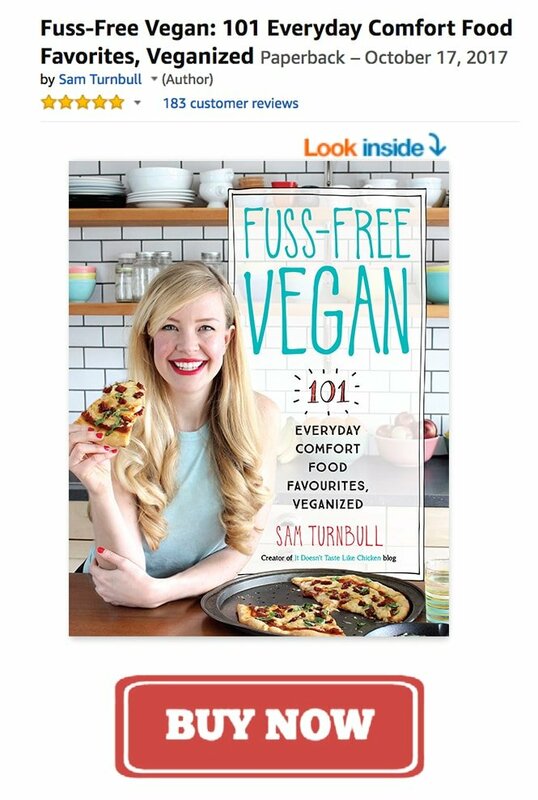 Seriously, this Canadian chick didn’t even realize how magical burritos were until she lived there. But a funny thing happened. Even though there was this huge Mexican culture, it was this Canadian chicks guacamole recipe that was requested at every party. 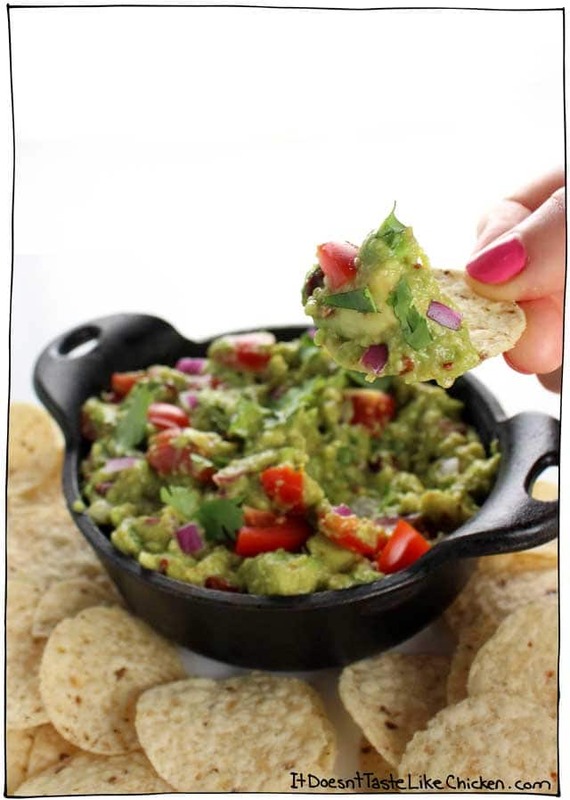 Whenever there was any kind of dinner, pot luck, or dominoes playing event, my friends would request my favourite guacamole recipe every time. Flattery beyond belief! Use cherry or grape tomatoes instead or Roma or other tomatoes. Cherry and grape tomatoes are sweeter and less juicy. 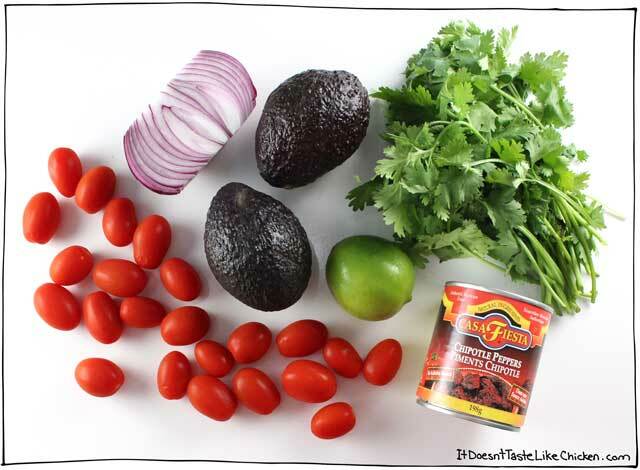 This makes for little pops of sweetness throughout and you don’t run the risk of watering down your guacamole with tomato juices. Chipotle peppers in adobo sauce are a must! Whether you use a lot for spicy guacamole, or just a small amount, these peppers add a hint of spice with a gorgeous smoky note. Lastly, when making the guacamole, don’t over mash it! 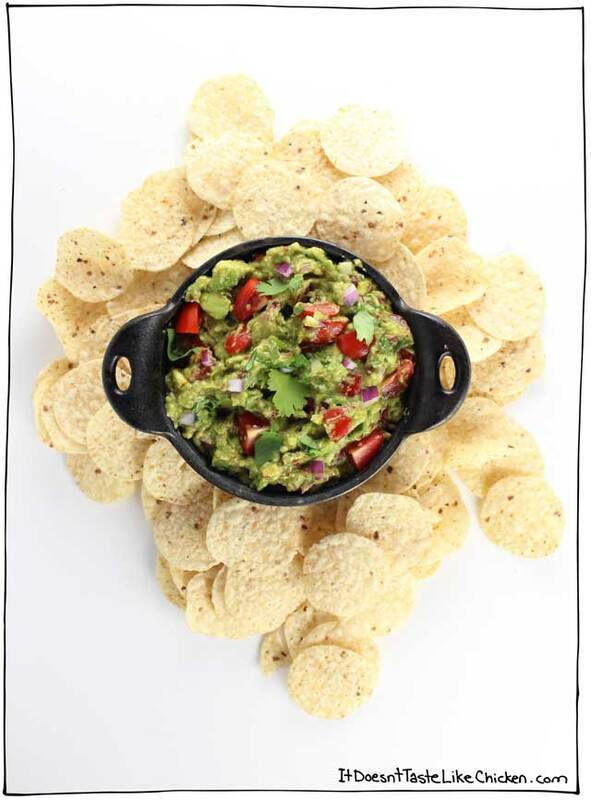 Soupy guacamole is a no-no. Leave some avocado chunks for texture. You won’t regret it. To make My Favourite Guacamole: prep all your ingredients. You will have chipotle peppers leftover, but I find when stored in an air-tight container in the fridge they seem to last forever. 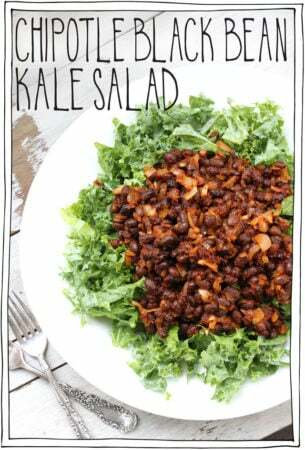 You can use the leftovers to make my Chipotle Black Bean Kale Salad, my Chipotle Lime Dressing… or more guacamole! 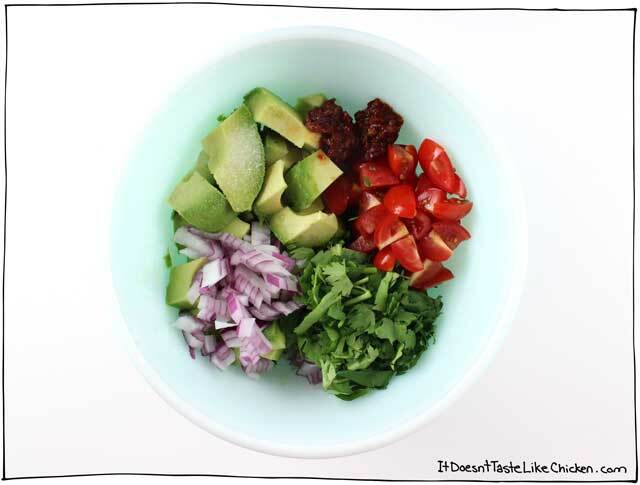 Add all of the ingredients to a medium size bowl. And mash together with a fork. Don’t over mix it here, you want some of that avocado to have texture. 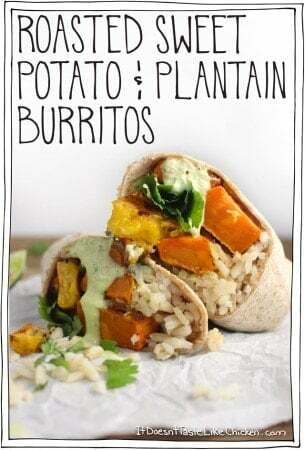 For presentation bonus points, you can add a couple extra pieces of tomato, red onion, and cilantro on top which will just give it that final va-va-voom. 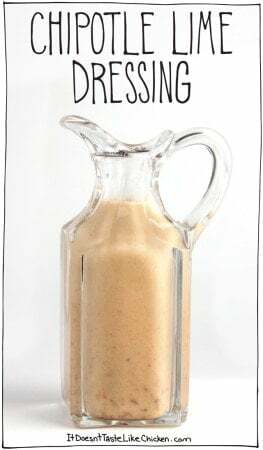 Yep, I’m giving away my food photography secrets. 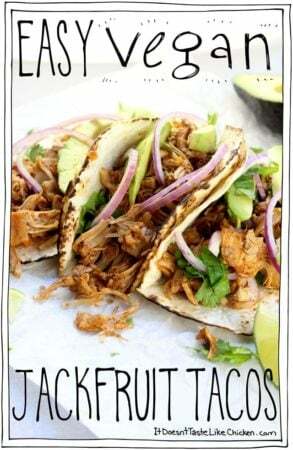 Serve with tortilla chips or use in a burrito, on tacos, or just about anywhere and everywhere. 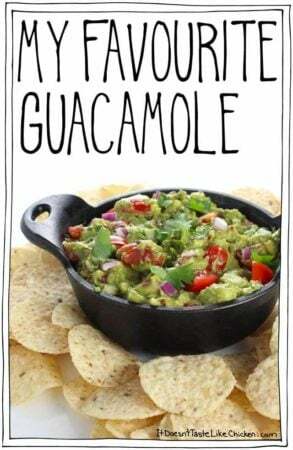 This is my favourite guacamole recipe ever! 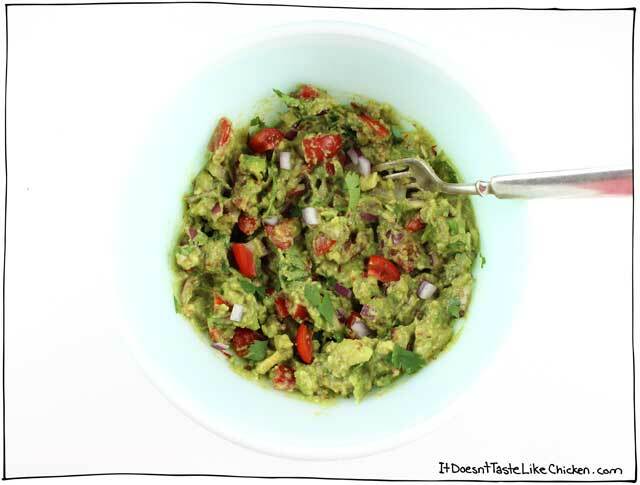 There are 3 hacks (including a secret ingredient), that take this guacamole to the next level! Add all of the ingredients to a medium bowl, and use a fork to mash everything together. Don't over mash, leave some texture. When serving you can make it look even prettier by garnishing with a few fresh pieces of tomato, red onion, and cilantro. 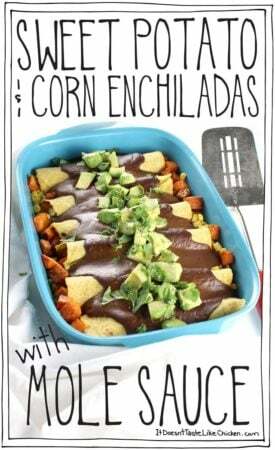 Enjoy with tortilla chips or anywhere else you like. Your website is visually so fun! This is a great version of guacamole and it looks perfect! Thanks for this awesome recipe. 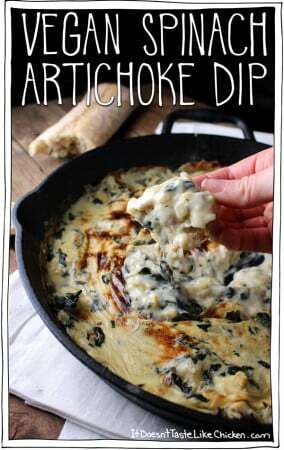 We made this for a Mexican inspired supper, including your stretchy mozz cheese. Fabulous! LOVE the smokiness the chipotle renders, as you described. Thank you for an amazing recipe. I hope you love it, Isadora!